Pictured at the official opening of the 6km Ballinahinch Greenway section are Tracey Dineen, Fáilte Ireland; Cllr Niamh Byrne; Hildegaarde Naughton TD; Kurt Lydon, Senior Technician, Galway Co. Council; Aoife Lydon; Eileen Mannion; Cathaoirleach of Galway County Council. Cllr Mary Hoade; Kevin Kelly, Chief Executive Officer, Galway Co. Council and Fionnán Nestor, Fáilte Ireland. The Cathaoirleach of the County of Galway, Cllr Eileen Mannion this week officially opened the Connemara Greenway following significant development work over the past two years — and in her speech made special mention of the 19 landowners who facilitated the creation of the route. 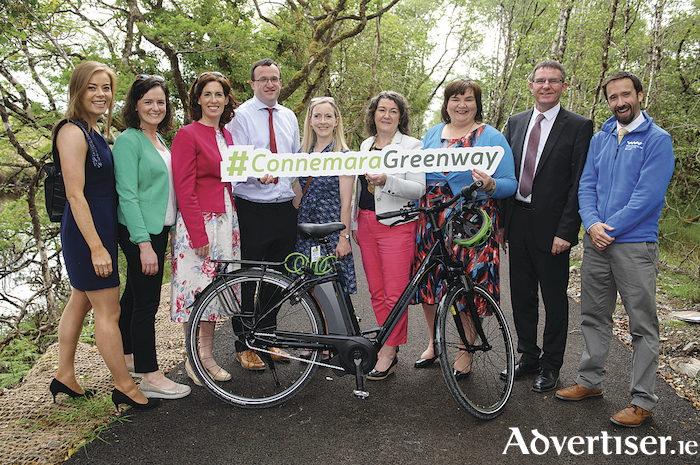 In 2016, Fáilte Ireland awarded Galway County Council a major grant of almost €896,000 for the development of the Connemara Greenway. It funded a new section of the route from Cloonbeg to Athry, running adjacent to Ballynahinch Castle, which is now open following a launch event at the site today. This development is part of a wider plan for the Clifden to Oughterard Greenway that has linked up with the planned Greenway from Galway City to Oughterard – ultimately resulting in a 78km Galway to Clifden Greenway offering a cycling experience of scale with international appeal for cycling enthusiasts. Opening the Connemara Greenway today, Cathaoirleach of Galway County Council, Cllr. Eileen Mannion, said she would like to acknowledge the significant contribution from the 19 landowners who have facilitated this dynamic development within their community. “I would like to thank them for their support and for working with the Council and other partners to facilitate access to this beautiful and unique environment. “I trust that the families and visitors that will use the Greenway, will come to love and respect this part of Connemara as much as the landowners and locals do.” The Cathaoirleach acknowledged the work of Galway County Council staff in progressing the project, and Fáilte Ireland for profressing the funding stream. Fiona Monaghan, Head of Activities at Fáilte Ireland, said that driving growth in the regions through tourism is a key priority at Fáilte Ireland, and having top-class visitor attractions is an integral part of this. “We are constantly looking for new opportunities to stimulate the development of compelling visitor experiences throughout the Country, and providing a grant for the Connemara Greenway made perfect sense as it is has huge potential to encourage visitors in Galway’s Wild Atlantic Way to explore less visited parts of Connemara.